Adelaide Hard Rubbish Collection & Removal | 1800-GOT-JUNK? 1-800-GOT-JUNK? is your full-service rubbish removal company in Adelaide! We remove it all from your home, office, retail location, building site, or any other location. Just call and we'll provide you with comprehensive service. In Adelaide hard rubbish removal is always available to you. Look around your home or business. If your space is cluttered with rubbish you need gone, call 1-800-GOT-JUNK? for the help you need. We offer comprehensive rubbish removal, no questions asked, and on your schedule. We make it easy for you to clear out that build-up of rubbish that's lurking in the basement, garage, worksite, or just about any other location. All you need to do is call us. We're happy to help. Hard rubbish tends to be difficult to get rid of and it also piles up quickly. 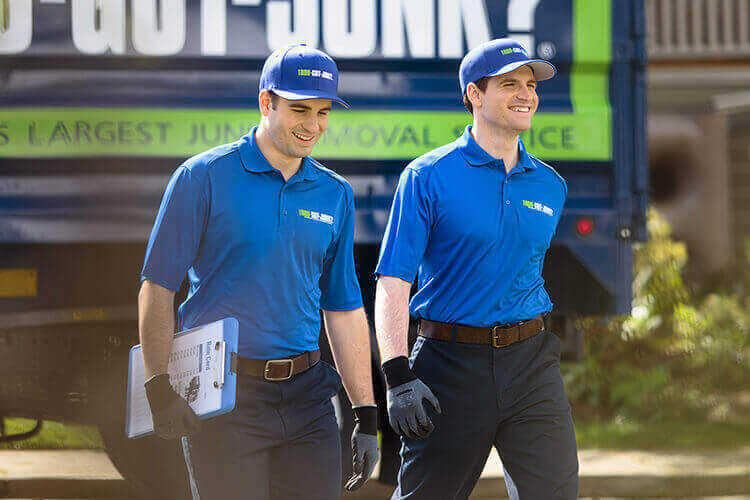 Don't worry, 1-800-GOT-JUNK? is here to help. All you have to do is point out what you want gone. We'll do the rest. You don't need to haul it outside or dig it out of the backyard. We'll do that for you. And, we'll even sweep up afterwards to ensure we leave your home a bit better than when we arrived. We're happy to help you clear it all away in no time. We take most types of unwanted items including most forms of hard rubbish. This includes furniture, appliances, mattresses, computers, electronics, and much more. We even haul away green waste for you. 1-800-GOT-JUNK? takes most types of non-hazardous rubbish throughout the home or business. Many business owners need immediate help clearing out workspaces and construction sites. Just call 1-800-GOT-JUNK? and we'll haul it all away for you in no time. We are happy to help with items such as construction materials, business-related electronics, waste from production processes, and much more. We take most types of non-hazardous materials. Whether you have an office tenant that you need to remodel after or a rental home that needs cleared away, 1-800-GOT-JUNK? does all of the hard lifting for you. You don't have to worry about your Adelaide hard rubbish removal ending up causing an environmental risk. Our team does everything we can to donate items that can be reused in any way. We recycle everything that we can and routinely help keep materials out of the landfill. If we do need to dispose of your unwanted items, we do so in an eco-friendly way, providing you with ample protection and peace of mind. We recycled before it was cool. It's easy to get the help you need. Call 1-800-GOT-JUNK? for same day rubbish removal services. Our smiling team arrives at your home with clean uniforms and shiny trucks ready to work. Just point and rubbish disappears. Really, we're happy to help you get that space cleared out to make room for new items. Tell us when you want us to come to your location over the phone or book your service with us. We'll provide you with a two-hour arrival window and give you a call 15 to 30 minutes before we arrive. You'll know exactly when we'll show up. We make it easy for you to get rid of your unwanted rubbish. Point to the items we need to remove, and it's gone. 1-800-GOT-JUNK? offers comprehensive Adelaide hard rubbish removal you can depend on. It's that easy to get the help you need clearing out your home or business. Put 1-800-GOT-JUNK? to work for you today.